The GVC Holdings PLC group of companies is a leading multinational sports betting and gaming business. We offer sports betting, casino, poker and bingo and operate some of the industry’s most popular online brands including bwin, Sportingbet, partypoker, PartyCasino and Foxy Bingo. In March 2018 we acquired Ladbrokes Coral Group PLC to become the UK’s largest high street bookmaker, adding iconic retail and online gaming brands, Ladbrokes, Coral and Gala to our portfolio. The Group, headquartered in the Isle of Man, is a constituent of the FTSE 100 index and has licences in more than 20 countries. The taxation of betting and gaming is complex – the Group is subject to a range of taxes, duties and levies in many of the countries where we have operations or in which our customers are located. We believe that tax revenue is vital in paying for essential public services, and for promoting economic prosperity and social stability. We recognise that our contribution to governments and national finances through the taxes we pay is important and significant. Achieving sustainable returns for our shareholders. The Group’s tax strategy is approved annually by the Board of Directors. Responsibility for the execution of the Group’s tax strategy is delegated to the Chief Financial Officer who reports the Group’s tax position to the Directors on a regular basis. The taxes and levies imposed upon betting and gaming companies have changed considerably over time, and the levels of taxation and/or levies to which the Group is subject may change in the future. 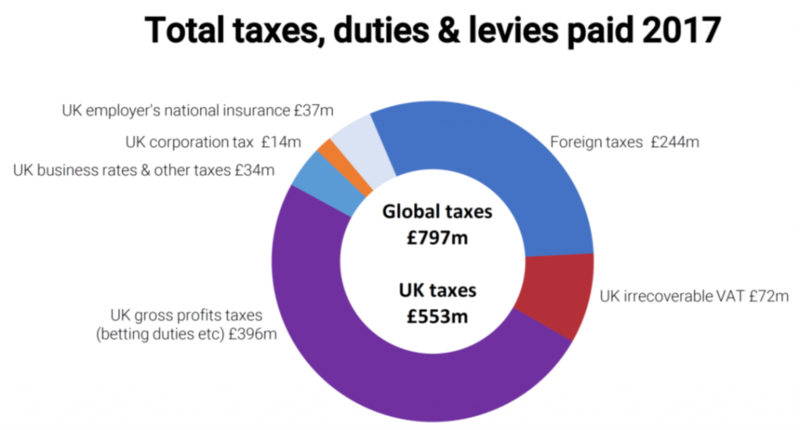 The Group’s geographical diversity and the nature of taxation of our industry lead to considerable complexity in our tax affairs. In order to mitigate the risks that arise, the Group actively identifies, evaluates, manages and monitors its tax risks. The Group has an appropriately qualified and resourced tax team to manage its tax affairs. In addition, where there is significant uncertainty or complexity in relation to a tax risk, the Group may use the services of external, expert tax advisors. We look to manage our tax affairs to support our business with the aim of ensuring that the tax consequences of our business operations match with the economic and commercial consequences of those business operations. Where a tax rule, regulation or incentive exists that may convey a tax advantage to our operations, such as tax depreciation from investing in our business, we may use that rule, regulation or incentive to support our business. In many countries, such rules operate automatically by law. For example, the Group has significant brought forward tax losses, and the Group will use those brought forward losses to partially offset its current year taxable profits where the law provides for this. The group will not enter into tax planning arrangements or structures that set out to achieve results that are contrary to the intention of the relevant legislation or which seek to exploit shortcomings within the relevant legislation. The Group will seek for all of its engagement with tax authorities to be conducted with honesty, integrity, respect and fairness and in a spirit of co-operative compliance. We recognise that there may be areas of differing legal interpretation between the Group and the tax authorities. Where this occurs, we will engage with the tax authorities to try to resolve the matters in a cooperative and expedited manner. Where a conclusion cannot be reached in such a manner, the Group may choose to litigate the issue through the relevant legal system. Where we believe it might affect our business or industry, the Group will engage constructively in the debate regarding the development of tax legislation, policy and administrative guidance. GVC Holdings (UK) Ltd regards this publication as complying with the duty under paragraph 16(2), Schedule 19, Finance Act 2016.